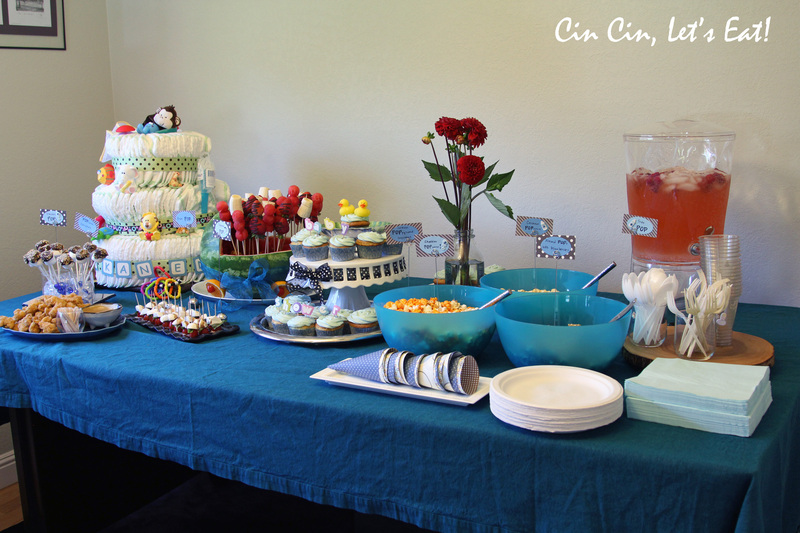 “About to Pop” Baby Shower – Cin Cin, Let's Eat! Hi food lovers, I have returned from my whirlwind summer adventures and can’t wait to share with you all the delicious food I sampled. Give me some time to sort through all the pictures and in the mean time, enjoy some pictures of a baby shower my friend Leslie and I hosted for our very dear friend Ike’s Bites. Since her belly is so BIG, it’s only fitting that we make the theme of the party “About to POP”! 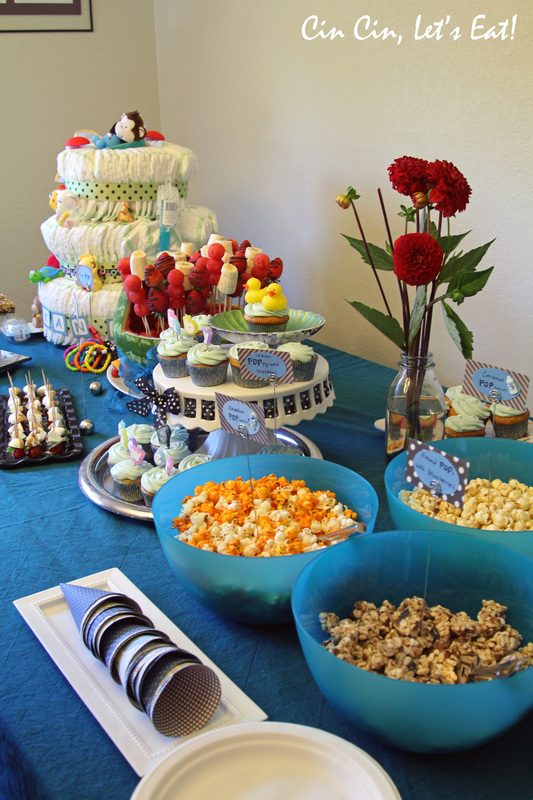 We decorated with balloons and incorporated “POP” into everything we served at the party. 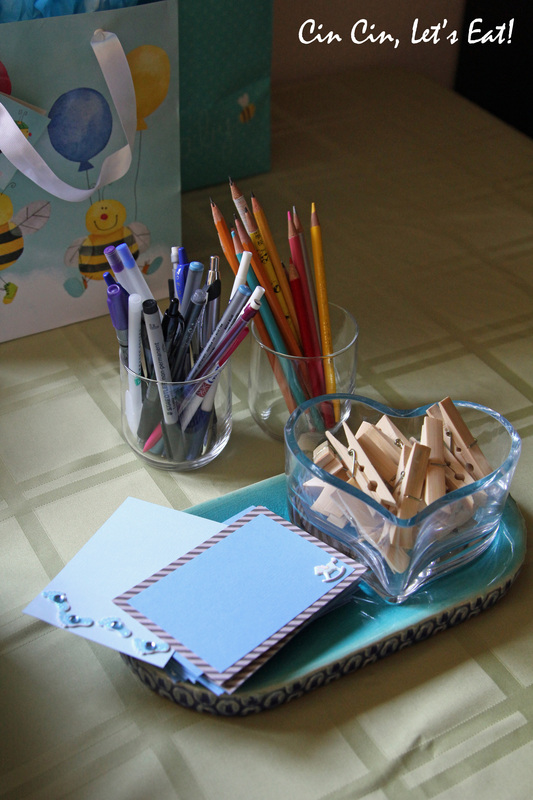 Guests wrote their wishes to the baby and to the parents-to-be. Once completed, these were attached, with wooden clothespins, to a long string of ribbon that is displayed on the wall. Thanks Suhwei for these beautiful paper pom-poms. Click here for instructions. They are super easy to make and would cost a lot less compare to buying pre-made ones. 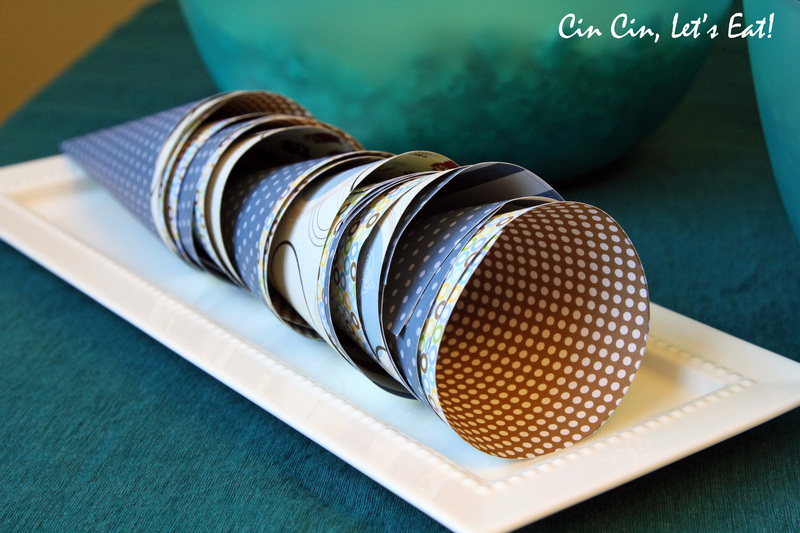 Paper cones for holding popcorn. You can find more instructions and template here. I went to a local scrapbook store and bought some beautiful and thick paper stock. We let our guests packed their preferred flavors of popcorn so we did not use the lollipop sticks to display on a piece of Styrofoam as suggested. 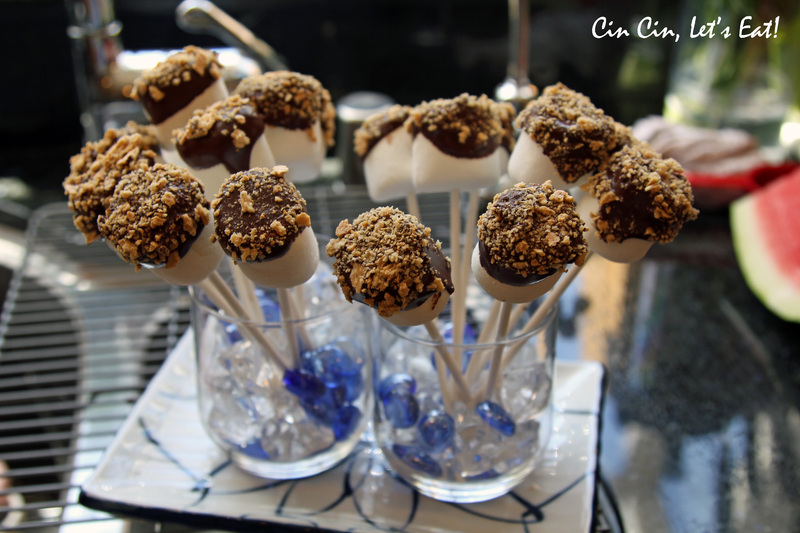 How cute are these s’mores pops? Step 1: put a few pieces of graham cracker in a Ziploc bag and crush them with a heavy pan or a rolling pin. Step 2: Melt some dark chocolate over a double boiler. Let cool until it starts to thicken slightly, this way it will not drip all over the place once dipped. Step 3: Add lollipop/cake pop sticks to jumbo marshmallows. Step 4: Dip marshmallow with chocolate. I chose to not dip and cover the whole thing with chocolate. Sprinkle the top with the graham cracker dust. Let chocolate cool and harden and voila! Note: It was hard to find some place for the s’mores pop to hang out and for the chocolate to cool. I placed a cooling rack over the sink (make sure it’s secure!) and let the finished products hang out on the rack, see below picture. 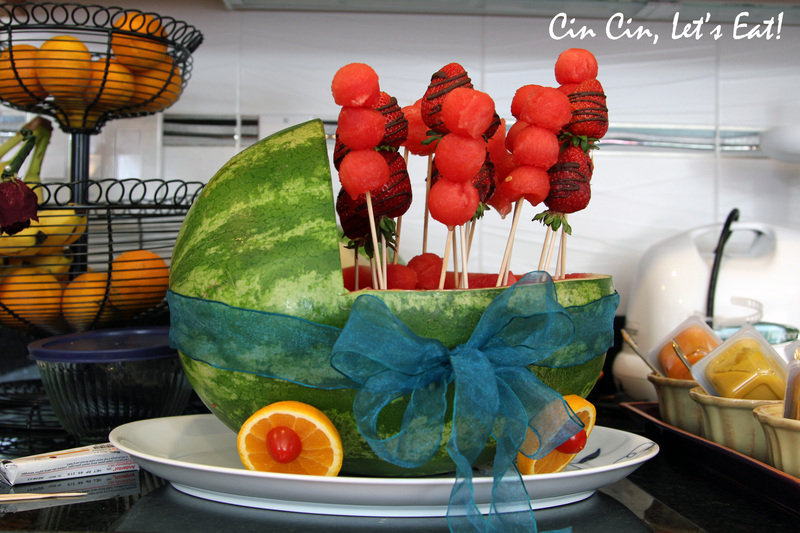 Fruit pops with a bassinet made from a watermelon. Got this idea off of Pinterest, the actual site here. I didn’t scoop out the watermelon completely because I needed to leave some in there to hold the skewers up. We originally planned to cut the fruits with cookie cutters (star, flower, and heart shapes) but the fruits were too ripe and couldn’t stay in shape. Eventually we scratched that idea and scooped out watermelon with a melon baller instead. 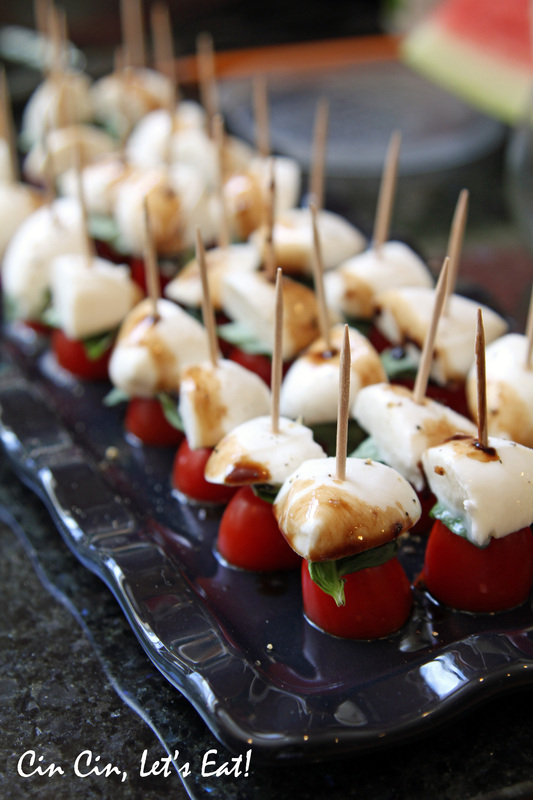 Caprese pops! Placed the halved the baby heirloom tomatoes on the bottom, basil leave in the middle, cube of mozzarella on top. Drizzle with olive oil and basalmic vinegar, sprinkle with salt and pepper. 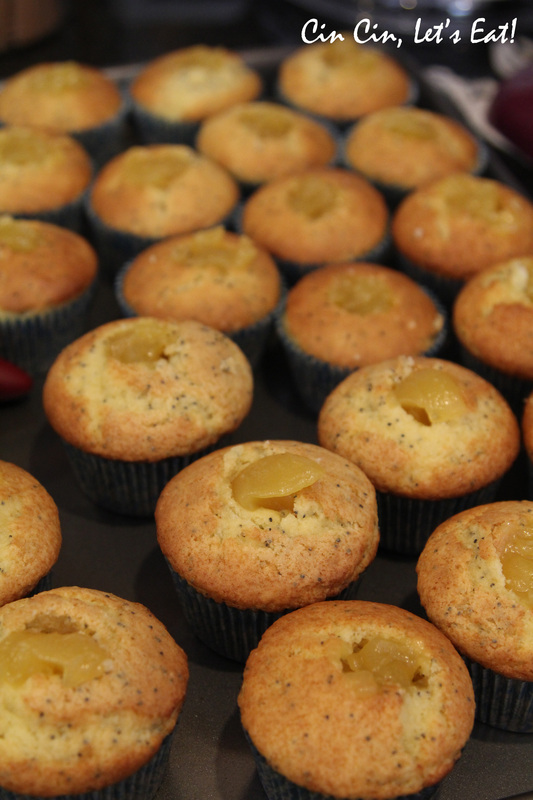 Lemon poppyseed cupcake using store-bought mix. Hollowed out the center and filled with lemon curd. I don’t have the fancy gadget to hollow out the center of cupcakes. I used a apple corer to punch the shape and scooped it out with a coffee spoon. 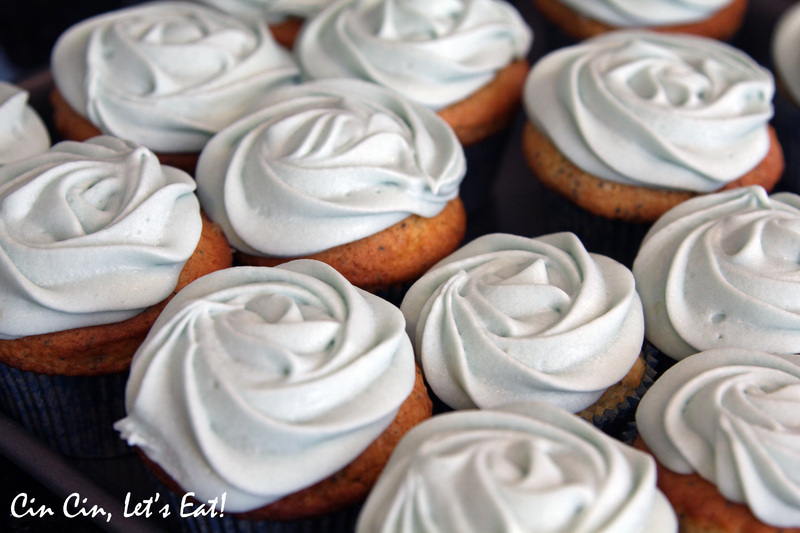 Topped with cream cheese frosting (with a few drops of blue food coloring.) I used a 2D piping tip, but you can also use a 1M tip. Pipe from center towards the outside. I also added a total of 2.5 cups of confectioners sugar so that the shape will hold up more, but I didn’t have enough time to refrigerate the frosting so it was kind of loose. 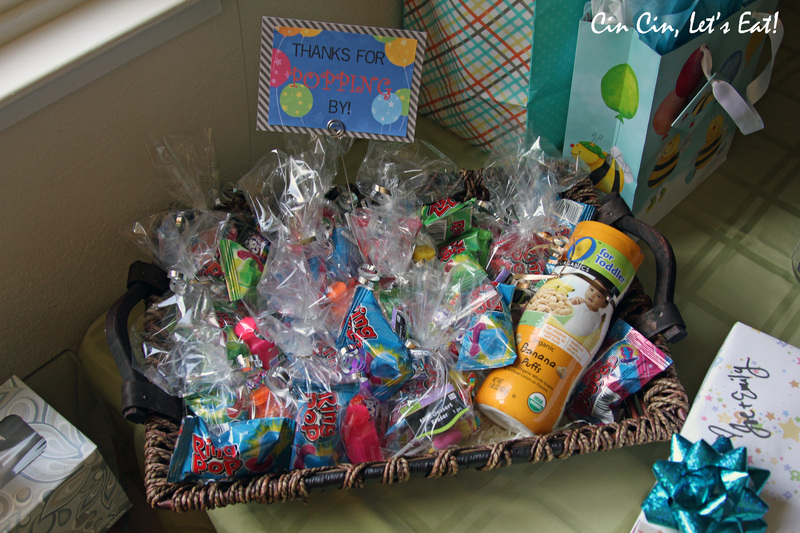 Party favors: blow pops, ring pops, bubbles, popsicle erasers. The bottle of the banana puffs was for the adorable 20-month-old toddler who attended the party. Can you see that a lot of these were store-bought or required very little bit of assembling? I try to always add a little bit of something extra to make it look more “homemade”. Gotta love short cuts! wow, everything looks great! must have been a nice baby shower for your friend. 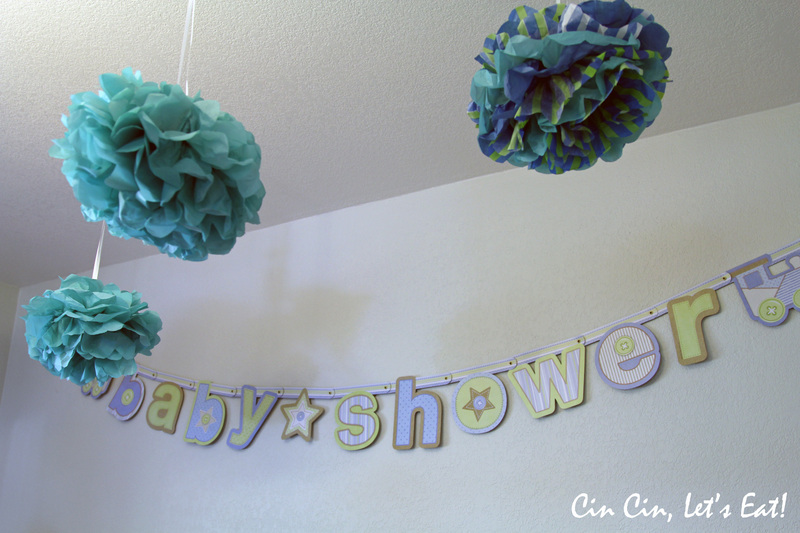 THE BEST BABY SHOWER I HAVE EVER BEEN TO!! (but i may be a little bias too :D). Mama and Baby IKE say, “Thank you!!! !” We had tons of fun. 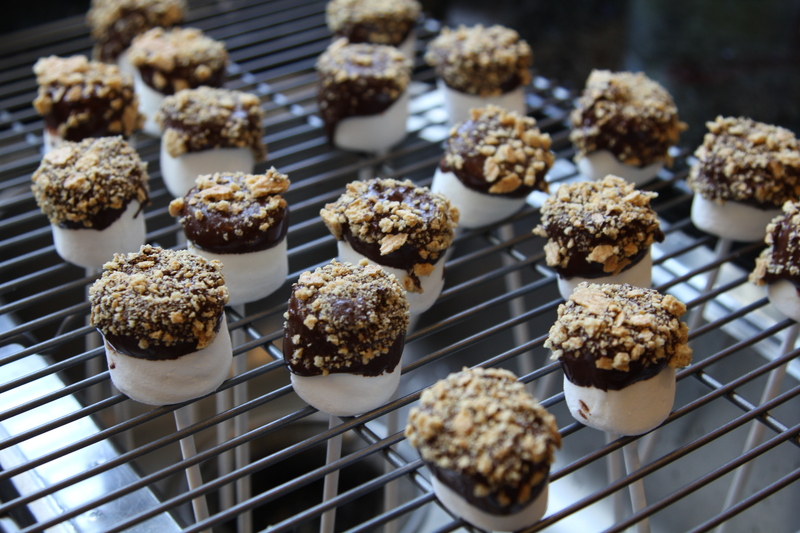 Also, what a genius way to let those s’more pops dry! Wow, this almost make me want to have a baby! I said almost. 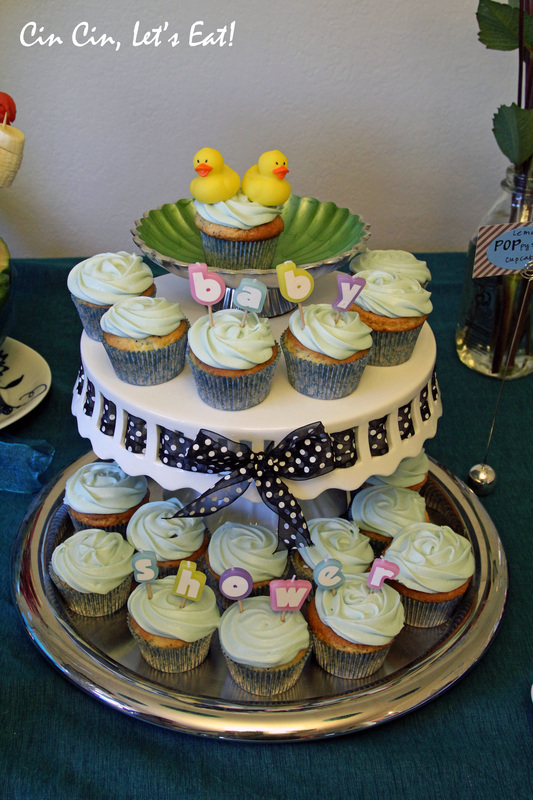 Or maybe I just want a baby shower. 😉 Congrats, Ike’s bites!!! And awesome job, Emily and Leslie! Everything looks amazeballs, or should I say, amazepops! Love your semi-homemade approach, too!